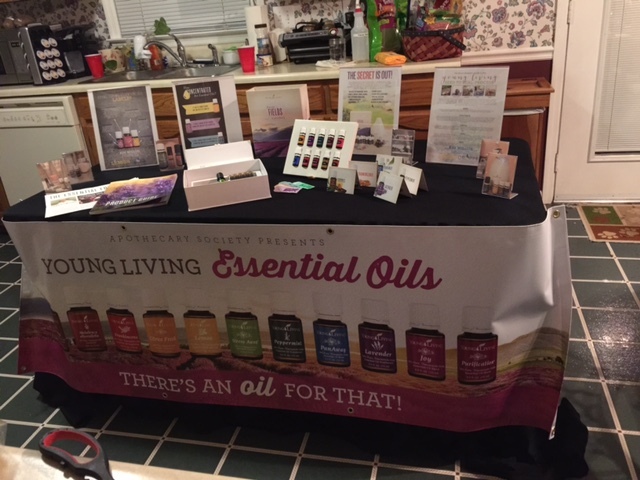 It’s been a busy work week, and now I’m getting ready for my first Young Living Essential Oils booth at the Ready for Fall at Cool Springs event tomorrow, Saturday, 10 a.m.-9 p.m. This is my first essential oils booth, but by far, not my first booth. I am a seasoned veteran of craft fairs. For the past several years, Gemama Handcrafted & Vintage Jewelry has been fortunate enough to pass the show juries and to set up at craft shows around Middle Tennessee. I have not participated in any craft shows this year, and was humbled to have friends tell me they looked for me at two recent shows. I decided about this time last year that I would no longer do outdoor shows. I lost my booth buddy to California a few years ago, and it’s a little difficult to get an “easy”-up tent up by yourself. Then there’s the dust that would cling to my jewelry and jewelry cards, displays and table coverings, rain, and putting out lots of little items and packing them away, along with displays, each night, to avoid night time dew. When I came home from my last outdoor show, I told hubs I had given my tent away. He thought I was crazy. The tent had a couple of broken metal pieces, and the couple who took it knew, and they were happy to have it. I didn’t want to fool with it again. You really have to be passionate about your craft to withstand the outdoor elements. Or crazy. Like the time we had to close shop at the Cornbread Festival in South Pittsburg, Tenn. (which never happens) because of tornado warnings. The wind had already lifted several pairs of earrings out of my tent. Or the time at Uncle Dave Macon Days in Murfreesboro, Tenn. when I made record time packing my jewelry up and getting out of my self-encased lightening rod, otherwise known as a tent, while my friend, Carol, called to say, “Hey, you need to get out of there. There’s a bad storm.” Or the time my booth buddy and I arrived in Winchester, Tenn. and set up our booth on a cold, rainy day, only to watch the water flood through our tent. We packed up and left before the show even started. The good news about tomorrow’s show is that it’s inside, in a nice mall in Franklin, Tenn. So, while I won’t have to deal with a tent or lots of little items and jewelry displays, I still need to prepare, as anything worth doing is worth doing well. I will make a list of everything I need for tomorrow and pack my car tonight. I’ve already recycled 85 2 oz. 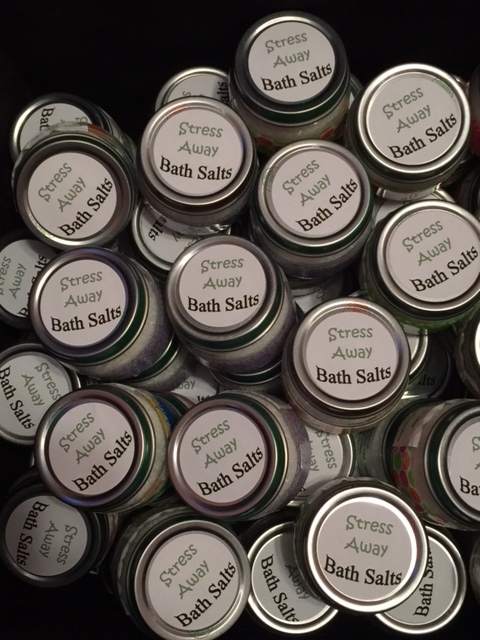 baby jars, filled them with homemade Stress Away bath salts and labeled them and a mountain of brochures. First come, first serve. Last night, I set up a table in the middle of the kitchen to figure out how to attach my banner to the front of the table and what my sit-arounds would look like. And, I am lucky to have a friend to help me out tomorrow. Thanks, Paula! To borrow a phrase from hubs, whose hobby is magic, I plan to pack small and play big tomorrow. If you’re in the area, I’d love to share my passion for essential oils with you and leave you with some information and a little gift. Until next week, I’d love to hear your booth war stories. Feel free to share in the comments below. I hope you and yours have a fabulous weekend!